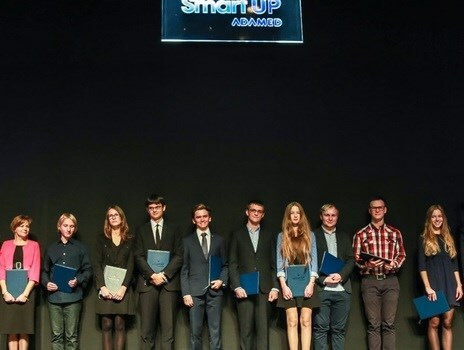 A gala summing up the first ADAMED SmartUP scientific and educational programme was held on Thursday, 8 October at the Syrena Theatre in Warsaw. At the gala the 10 main award laureates were announced, to be provided with an individual tutoring programme. The awards were presented by the representatives of the Scientific Council of the Programme, while the guests included representatives of the best Polish universities, the government, business and education. Over 5.5 thousand candidates applied to the programme and faced a multi-stage recruitment process. To get to the final ten, the young science enthusiasts faced surprising puzzles and unexpected plot turns in a scientific game, took an online knowledge test and met the Scientific Council of the Programme. In the following year, the Council selected 50 participants of the science camp that took place in July this year in Warsaw. Based on factors including commitment and achievements during the camp, motivation to learn and interview evaluation, 10 laureates were selected to be included in an individual tutoring programme. Who’s in the final ten? Maksymilian Głowacki – a student at the Stanisław Staszic High School No. 14 in Warsaw; laureate of the 30th Chemistry competition at the Warsaw University of Technology, finalist and laureate of mathematics, physics, computer science and chemistry Olympiads and competitions. Participant of the “University of Technology for Young Chemists” programme. He loves playing tennis and volleyball in his spare time. in Gdynia. He spends his time not only exploring subjects corresponding to his class profile – biology and chemistry – but also computer science and humanities. He was head of the first Polish high school team to take part in the synthetic biology competition, IGEM, organised by MIT in the USA. He is interested in making and editing films, in computer graphics and in foreign languages. Aleksandra Janowska – a student at the Stanisław Staszic High School No. 14 in Warsaw, laureate of numerous life sciences, mathematics and English language competitions. She received the Scholarship of the President of Warsaw for outstanding achievements in education. She is not only an enthusiast of science but also of painting, literature, singing and foreign languages. Marcin Bąk – a student at the Stanisław Staszic High School No. 14 in Warsaw. Finalist of the Technical Knowledge Olympiad and a distinguished finalist of the Physics competition at the Warsaw University of Technology. He loves science, engineering, aviation and foreign languages, including Japanese. Oskar Grudziński – a student at the Stefan Batory High School No. 2 in Warsaw. With the science club team “Fenix” he won the first place in Poland and the gold medal in the Young Physicists’ Tournament. He presented the team’s achievements during the International Young Physicists’ Tournament (“Physics World Cup”) in Thailand, where he also won the gold medal. Aviation, model building, chess, guitar playing, diving… are just a few of his numerous interests. Michał Bączyk – student at the Stanisław Staszic High School No. 14 in Warsaw. Already in the first grade, he became a finalist of the 65th and 66th Mathematics Olympiad and the 64th Physics Olympiad. Winner of the 27th European Union Contest for Young Scientists. He is currently pursuing an independent scientific project in collaboration with the Department of Physics at the University of Warsaw. Patrycja Paśniewska – graduate of the Academic Middle School of the Nicolas Copernicus University in Toruń, laureate of numerous competitions in biology, chemistry and physics. Furthermore, she has been successful in athletics competitions. She loves fantasy, rock music and ballroom dancing. Tomasz Białecki – graduate of the 25 p.p AK Middle School in Żarnów. He achieved 2nd place in the district mathematics contest “Rusz Głową” (Use your head), and was a finalist in the Provincial Subject Competitions in Mathematics and Physics. In his spare time he builds electronic devices and plans to build an automatic arm controlled by a microcontroller in the near future. Bartosz Gąsiorkiewicz – graduate of the Belgian Polonia High School No. 14 in Wroclaw, laureate of the first stage of the 43rd Biology Olympiad, bronze medal laureate of the 25th International Biology Olympiad in Indonesia. He received a scholarship of the National Children’s Fund programme for talented youth. He is currently in his first year studying medicine in Krakow. The laureates of the first edition of ADAMED SmartUP will concentrate on planning further scientific development under the supervision of experienced scientific counsellors. After 10 months, those with the greatest potential will receive scholarships tailored to their individual needs.